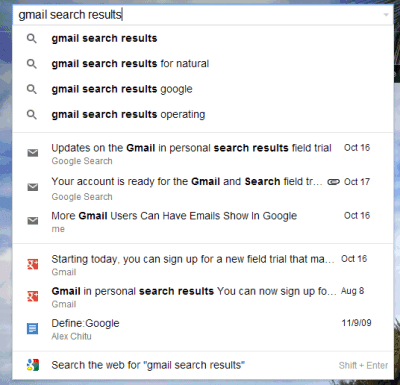 A few months ago, Google launched an experimental feature that allowed to find your Gmail messages and contacts in Google Search. Now there’s a new version of the experiment that also includes results from Google Drive. The experiment also improves Gmail’s search results: while you type your query, Gmail shows relevant messages, Google+ posts, Google Calendar events and Google Drive documents. It’s interesting to notice that sometimes the results from Google Search are hidden by default and you need click “show results” to see them. If the results are really relevant, Google expands them automatically. It’s also worth mentioning that Google only indexes GDrive filenames and Google Calendar event names, while including both Gmail subject lines and the body content. Probably Google will also include personal results from other services like Google Maps, Google Play, YouTube, Google Reader, so you can quickly find the maps you’ve created, the videos you’ve added to favorites or “liked”, the apps you’ve installed or the books you’ve recently read. The trouble with including so many different services is that it’s hard to determine if the results are actually relevant and to rank them.